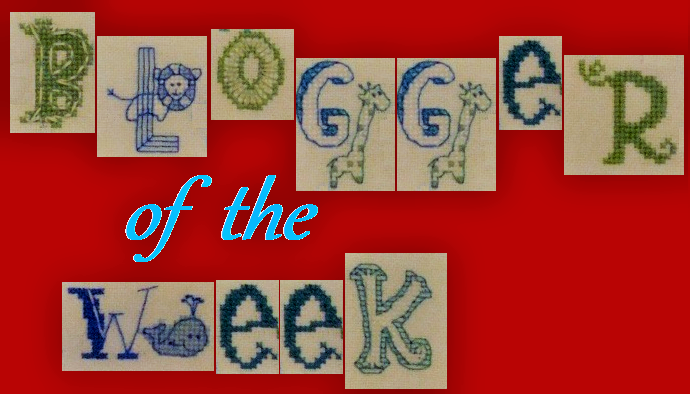 This week's Blogger of the Week is someone who has been a follower of mine (and vice versa) for many years now. I fell in love with her photo of her youngest son dressed as a little dragon from the first time I saw him! He's still there in her current header. I’m Astrid, married to DH almost 22 years. We have identical twin boys (our Gmen), 19 years old this month, and 10 year old Nathan. 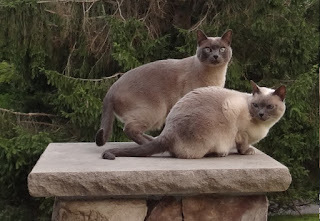 We have two spoiled Tonkinese cats, Ming and Maximus. I was born in Wales, but we moved to the States when I was two. I live in Maryland, near Baltimore, but also close to Washington, DC. 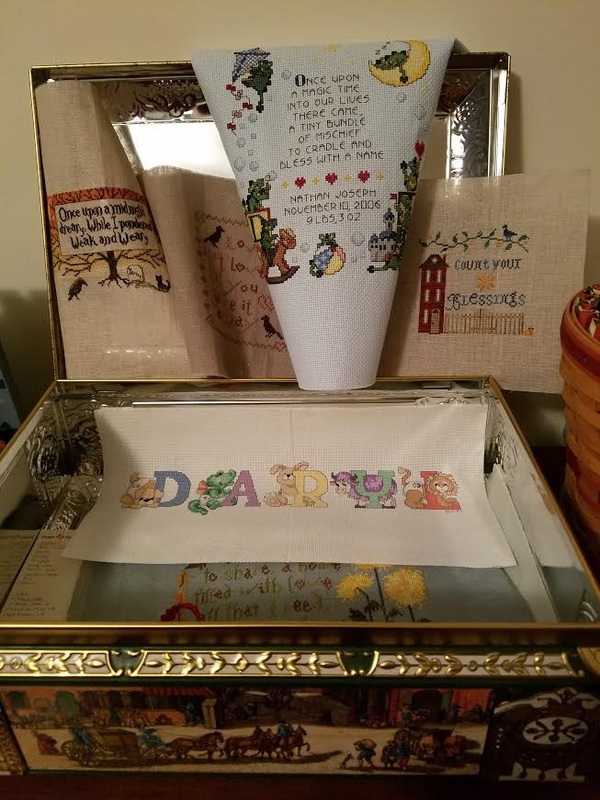 When I was 12 years old, we did a needlepoint project in school making ornaments. From there I taught myself cross stitch and liked that better. I took a break when having the boys, only stitching here and there. Now I can stitch whenever, but get easily distracted! I had to look that one up! This August it will be seven years. I guess I started because I wanted to show my stitching projects. Being Welsh, I especially love dragons, hence “Dragon Stitches”. 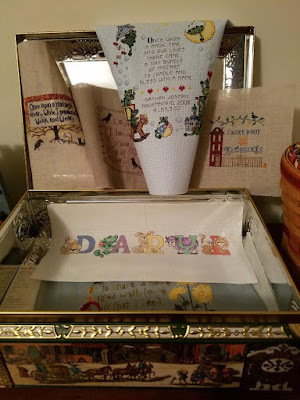 I added “and Stuff” later since I was blogging about more than just stitching. My newest addition to the blog is being Thankful on Thursdays. I USED to be an OAAT stitcher until I found the internet and blogs! Now I try to finish pieces if they’re small and the bigger ones I tend to rotate when I get tired of working on them. I’d like to think I’m organized, but I do stray. I like a variety of styles, but I’m not that fond of samplers. I love Margaret Sherry, especially the cats! I also love Nora Corbett’s fairies and mermaids. I’ve been working on her Emerald Mermaid, but got frustrated with her skin so I’m taking a break. And don’t forget the dragons! I would have to say my Trick or Treat Fairy by Nora Corbett. 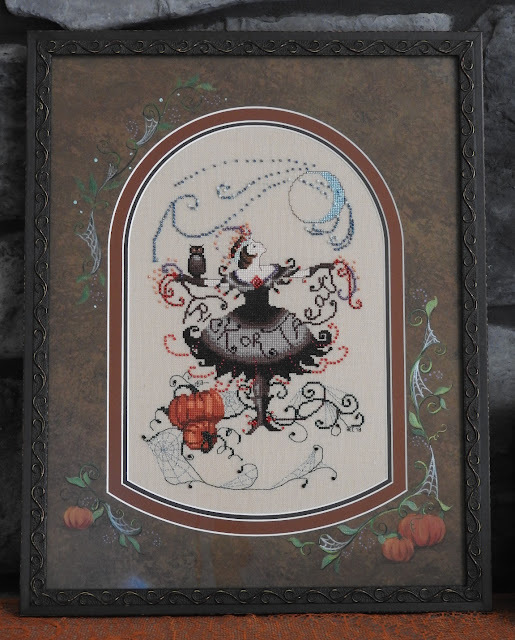 I finally had her framed by Jill Rensel at Rensel Studio last year and they made her even more beautiful! Whenever I finish my mermaid, she’ll be sent there too. She will be displayed year round! Nothing major, just trying to start a piece 3x’s and getting it wrong every time! I have yet to try again. I’d like to try Hardanger one day and I definitely need to learn more finishing techniques. I can knit scarfs, but would like to learn how to crochet. I’ll include learning German, maybe even Welsh! Oh, and I’d love to learn how to play the piano. I have a lovely German tin with plenty of pieces inside just waiting to be finished! Since most of my finished pieces have been framed, I’d say I like them framed. But the smaller pieces I stitch, I like to make into ornaments. Patiently waiting to be finished. Since most of the things I make are for someone else, I make what I think they would like. Otherwise – Halloween for me! As a little girl I wanted to be a “stewardess” aka flight attendant. Now as an adult it’s something I’m seriously thinking about it, I’m just not sure when! Many thanks to Jo for making blogging fun! I love that I’ve met so many stitching friends in the blogging world. The bad part… I’ve been so good about not adding more stash than I already have, but you all make it so hard!!! To finish this week's post I'd like to add a link to what is probably my favourite non-stitching blog post - Astrid's Annual "I'm Not a Turkey" line-up. Please visit this post and check out the previous years too! Great to learn more about you Astrid. Lovely to learn more about you Astrid. I had no idea you were Welsh! We live not far from Wales and visited earlier this week. I love your Trick or Treat Fairy, the framing and mount are spectacular and really set off your stitching. I have really enjoyed reading about you Astrid.Your Trick or Treat Fairy is beautiful as is the box you keep your unfinished pieces in. So nice to meet your family and learn all about you. Wonderful to meet you and lovely work on the fairy! Nice meeting you and getting to know you better!Love your stitched pieces!Excellent work!AriadnefromGreece! Your Trick or Treat fairy is gorgeous!! Delightful to find out more about you, Astrid and fun to know the why behind your blog's name. Very nice to meet amd learn more about you Astrid. Your Trick or Treat Fairy is stunning and I can see why you would keep her on display all year-round! Lovely to read about you Astrid, I had no idea you were Welsh born. Trick or Trear fairy is stunning. Your turkey posts are always a fun read. Thank you for sharing all about You and your stitching. It is so nice to learn more about you. Nice to meet you, Astrid! Your Trick and Treat Fairy is gorgeous and I think my grandma has that very same tin - she's not keeping cross stitch in hers, though! Hey, my friend! I guess I'm one of your friends from the blogging world, though we've known each other a while in real life. Congratulations on being chosen as Blogger of the Week!! How lovely to learn more about you, my dear. Lovely photo - your men are all so very handsome. Gorgeous, gorgeous fairy. So nice to learn some more things about you. Your Trick or Treat Fairy is just gorgeous. I also used to be a OAAT stitcher, even with my big projects. But on the internet I learned that there are people with lots of WIPs and found that it's fun to have several WIPs, lol. Just the same story as yours. It's nice to know more about you, Astrid. Wow, your boys truly are bookends, aren't they? And so handsome! Were you able to keep your lovely Welsh accent?